How do you design the Master Page? I was testing the Demo Template of the "Login Tools Demonstration". I figured out how to link the Master page to the selected page. When viewing the "Login Tools Demonstration" the text menu(?) links the page to the master page. The text and form is in a side window. The side window is a designated page. How do you do this? What I am asking is how do you from the Master Page link pages to the selected page. So Home, Getting Started, User Administrator, Login, Sign up, Change Password , Password recovery and Protected page appear on the same page rather than switching to an entire other page? I tried breaking down the Demo Template but so far cannot figure it out. Re: How do you design the Master Page? Is it some kind of floating layer page or responsive page overlay? The login demo template uses an 'Embedded Page' object to reuse the objects from the master page. I have Webbuilder 12. Do these instructions match close enough from 14 to 12? I have been working on designing an Admin page to serve the function of the "Login Tools Demonstration Demo" page. I have not fully figured it out yet but I will soon. 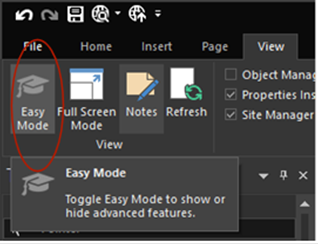 The 'embedded page' was called 'master objects' in version 12. Everything else works the same. Re: *** Solved***How do you design the Master Page? I am trying implement the Master Page or embedded page design as shown in the documentation https://www.wysiwygwebbuilder.com/embedded_page.html. Why is it on WYSIWYG WB 14 on my Toolbox, Layout section there is no embedded page option on the list of tools? Re:*** Solved***How do you design the Master Page? Its possible that you may have enabled 'Easy Mode'? when this is enabled 'Easy Mode' will hide all advanced features. Yes! Now changed and visible!